Various FENSA building regulations apply to new or replacement windows. Please read the FENSA guidance booklet. How do I get a FENSA certificate? FENSA certificates certify the actual installation. Your installer should be able to issue a FENSA certificate. If not, or you are installing yourself, your local Building Control can certify your installation. More information: www.fensa.co.uk. 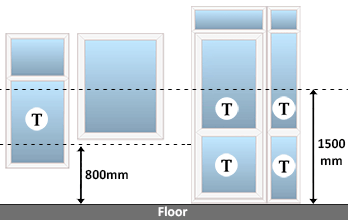 Glazing at low levels: if the bottom of the glazing is within 800mm of the floor level. Glazing in doors: any glass in doors that starts lower than 1,500mm from the floor. Glazing adjacent to doors: windows/side panels starting within 300mm of the edge of a door and also starting within 1,500mm from the floor. On upper floors, all rooms must be fitted with fire escape windows if they are not more than 4.5 meters above ground level (unless the room has direct access to a protected stairway). This is usually the case for the upstairs of a conventional two-storey dwelling. A fire escape window should open without obstruction to at least 0.33m² and at least 450mm high or 450mm wide. If one of the dimensions is at the 450mm minimum then the other dimension will need to be at least 734mm to achieve 0.33m². The route through the window may be at an angle rather than straight through. The bottom of the openable area should be no more than 1100mm above the floor. Windows fitted with our Fire Escape and Easy Clean hinges comply with the above regulations as long as the openings are sufficient; we recommend 600mm pane width. All rooms must be adequately ventilated to avoid the accumulation of contaminants and/or condensation. Purge ventilation is required in rooms prone to water vapour such as bathrooms and kitchens. Other rooms require background ventilation. If the original windows have trickle vents the new ones have to have them too. Also the total openable area should be at least the same. Openable windows are usually sufficient for purge ventilation. To assist with ventilation, windows can be fitted with a two stage locking system where the window is completely closed on the first setting but allows airflow through a small gap on the second setting, while still being locked. Trickle vents can also aid in ventilation and can be left open all year round if required. All our windows have two stage locking system, therefore can be left on the vent setting while still locked. Typically, background ventilation is positioned at least 1.7 metres above finished floor level to avoid discomfort due to draughts. Adding a trickle vent to a window is usually enough for background ventilation.